NASA's MESSENGER mission to Mercury has released an updated ACT-QuickMap tool with new 3-D navigation capabilities as illustrated by this "fly around" view of the Caloris impact basin. This update was among the new and improved products released by the agency's Planetary Data System (PDS), an organization that archives and distributes all U.S. planetary mission data. With this 16th data release, the MESSENGER mission has shared more than 10 terabytes of Mercury science data, including nearly 300,000 images, millions of spectra, and numerous map products, along with interactive tools that allow the public to explore those data, notes Susan Ensor, who for the last decade has managed the MESSENGER Science Operations Center, which oversees the preparation of these data. 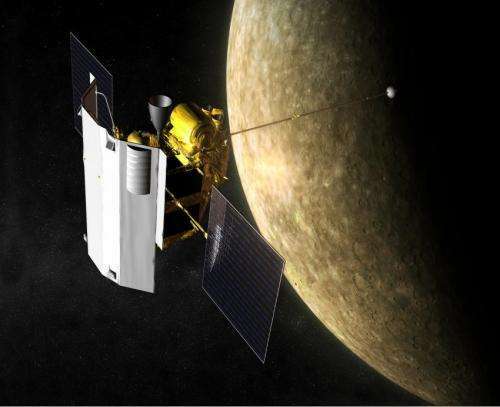 This release, which includes the redelivery of a subset of previously delivered products as well as new products created from data acquired through the end of Mercury orbital operations on April 30, 2015, is the final one for the MESSENGER project, which ends on May 31. After a 6.6-year interplanetary cruise phase, during which the spacecraft flew by Earth once, Venus twice, and Mercury three times, MESSENGER was inserted into orbit about Mercury on March 18, 2011 (UTC), becoming the first spacecraft ever to orbit the innermost planet. The primary orbital phase lasted one Earth-year and was followed by a one-year first extended mission, completed on March 17, 2013, and an additional two-year second extended mission, completed on March 28, 2015. A final one-month campaign concluded with the impact of the MESSENGER spacecraft, as planned, onto the surface of Mercury on April 30, 2015. Following impact, a one-year period of data analysis and archiving concluded with MESSENGER release 15 by PDS on May 6, 2016. NASA awarded the mission a one-year extension so that the MESSENGER team could provide an additional set of data products – some new and some enhancements of previously delivered products – anticipated to be of high scientific value to the community. This final data delivery includes 12 new products. Two large mosaics, offered for the first time, feature the Caloris basin and another large impact basin on Mercury. Also provided is documentation of the low-altitude orbit analysis conducted with measurements from the Mercury Laser Altimeter (MLA), one of seven science instruments on MESSENGER. "The MLA has generated improved polar digital elevation models (DEMs) using the methodology adopted for processing the low-altitude orbits generated in the final year of the MESSENGER mission," noted MLA Instrument Scientist Greg Neumann of the NASA Goddard Space Flight Center. "The low-altitude orbital products archived in delivery 16, and the assessment of the operational navigation products, will assist in data analysis and future mission planning. The polar DEMs at latitudes north of 75°N, where MLA coverage is optimal, are the highest resolution and accuracy obtainable and will be useful for illumination studies, image registration, and thermal modeling, particularly within regions of persistent shadow." Eight products included in earlier releases and also included in this release (with updates to calibration or photometric corrections and/or other improvements) include improved versions of all of the global and regional image mosaics of Mercury surface. "This release includes four global monochrome maps that show Mercury's geology under a range of different lighting conditions and three color maps that show the variations in materials that make up Mercury's surface," said Mercury Dual Imaging System (MDIS) Scientist Nancy Chabot, of the Johns Hopkins University Applied Physics Laboratory. "In particular, the global eight-color map is much improved, due to improved registration between the images that are used to produce this map, resulting in a map that more clearly shows the details of Mercury's surface features." Updated MDIS global mosaics are available for download from the MESSENGER Web page. During the final project extension, the MESSENGER team prepared several tutorials, including two tutorials for use in analyzing the data collected by the Fast Imaging Plasma Spectrometer (FIPS) from orbit around Mercury. "These tutorials guide users through techniques that we use to analyze the physical properties of the measured plasma ions in detail, including their density, energy distribution, and flow direction," explained Energetic Particle and Plasma Spectrometer Instrument Scientist Jim Raines of the University of Michigan. "We also included a software model of what FIPS would observe for a given set of plasma conditions, taking into account the motion and pointing of the spacecraft automatically," Raines added. "We think that these tutorials will really help open access to the use of FIPS data for understanding Mercury's space environment to a much wider audience in the space science community." All data sets in this MESSENGER release are available at https://pds.nasa.gov/subscription_service/SS-20170512.html. All of the MESSENGER data archived at the PDS are available at pds.nasa.gov. MESSENGER Project Manager Helene Winters of APL praised the Science Operations Center team for maintaining "a record of on- or ahead-of-schedule releases to the public. This was made possible through the leadership of Susan Ensor, who was responsible for the mission's data archiving effort, working in close coordination with her team, the MESSENGER science team, our data pipeline contractors at Applied Coherent Technology, and the PDS node representatives," she said. "Each of the 16 data sets is thoroughly documented, so the measurements may be understood by and their use facilitated for generations of new investigators." "This 16th data release is the capstone of the MESSENGER legacy," offered MESSENGER Principal Investigator Sean Solomon, director of Columbia University's Lamont-Doherty Earth Observatory. "It is the hope of the many engineers and scientists who each devoted up to two decades of effort to ensure the success of the first orbital mission to Mercury that the data returned by the MESSENGER spacecraft will continue to fuel scientific discovery for decades."